If you would like to be worth millions of dollars one day, the most common way to do it is to become an entrepreneur. But how does it happen? How can one or two or three people be founders of a little startup one day, and then a few years later the startup is worth $200 million and the founders each have tens of millions of dollars? The answer to this question is stock, and the way that stock works in a startup. If you understand how stock works, it is much easier to understand what startups and entrpreneurship are all about. If you are an entrepreneur and you are going to do a startup, then the traditional path is to raise money from investors. A typical path is accelerator to angel investors to venture capital firms, or crowdfunding to angel investors to VCs. A startup often needs the money both to fund the early development of the MVP/prototype and kick things off, and then they need more money to scale the company up. So what is going on here? Let’s take a look at how stock works, and how stock allows startup founders to become millionaires. Let’s imagine that two founders start a startup called XYZ, inc. The founders could form an LLC or a C-corp, and in this case they have formed a C-corp from the start because they plan to take in investors immediately. They go to a lawyer and the lawyer draws up the incorporation papers for $2,000 or $3,000 (other options include services like Clerky). In the process of doing this, the corporation automatically creates shares of stock. The founders get to decide what to do with the stock. Here is a typical scenario. The founders decide to initially create one million shares of stock and to divide the stock equally, so each founder receives 500,000 shares (if the founders are smart, they will attach a vesting schedule to the shares, but this vesting schedule does not change our discussion). The founders have just received something. They each received 500,000 shares of stock. Are there any tax consequences? Usually when people receive something of value in the United States, someone in government wants to tax the transaction. But this is considered a unique situation. The startup is just starting, so in many cases the value of the startup is considered to be zero. Therefore the founders receive their shares of stock with no tax consequences. This will not be the case later on, for example when the startup tries to give shares of stock to employees as they join the company. But at this moment in history, the founders receive shares with a value of $0. Where do the shares for the accelerator come from? Usually, the founders vote to create new shares, and in the process the founders’s shares get diluted. So 52,632 shares of stock get created for the accelerator. These shares are literally created out of thin air on a sheet of paper when the founders vote to create the shares. These new shares (in the form of a stock certificate and a contract) are handed over to the accelerator, and the accelerator gives the founders a check for $75,000. Wait, what? Yes. This is exactly what happens. The shares are created out of thin air, and they are worth real money. Dilution happens too. 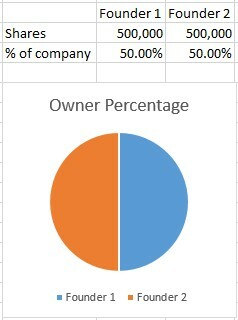 The owners each now own 47.5% of the company, rather than 50%. Another thing has happened here as well – something that is even more magical. In the process of purchasing these shares, the accelerator has provided a valuation for XYZ, inc. If 5% of the pie is worth $75,000, then the whole pie is now worth $1.5 million. Each founder, therefore, owns shares that are worth $712,500. At least on paper, this is what just happened. Yes, really. So if the net worth of the founders was $0 prior to this transaction, each founder has a new net worth of $712,500 on paper. You can now see why people can be so excited about doing startups. There are very few ways in normal life for a “normal person” to create hundreds of thousands of dollars so quickly. We say that the money is created “on paper”, but it can become real money. If the founders could convince a company to acquire the startup at this point for $2 million, this would be called a liquidity event, or an exit, and the three owners (Founder 1, Founder 2 and the accelerator) would receive their appropriate portions of the cash. 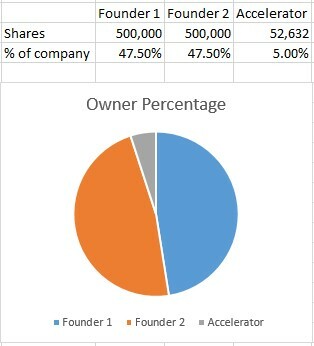 Each founder would receive 47.5% of $2 million, or $950,000. The accelerator would receive $100,000. This does not happen very often, but it can and does happen. The founders have created real value (in the eyes of the buyer) by pushing an idea into the real world, and the founders each walk away with nearly $1 million. The founders go through the accelerator’s program. In the process they create a business model canvas, refine it by “getting outside the building” and working with a mentor, meet a bunch of movers and shakers, etc. They also create an MVP/prototype for a web service described in the canvas. They refine their value proposition, build a web page to sell a monthly subscription to the service, and they get 150 paying customers on board. The new service is resonating nicely. The angel group now owns 20% of the company. The three existing owners were diluted in the process. This is not spectacular by Silicon Valley standards, but this is certainly a decent base hit of an exit. And look at it from the founders’s perspective. They probably both were paid decent salaries during the two year period, and at the end of two years they each received a cool $4.5 million check. The other alternative for the angel group is to introduce the founders to a VC firm, and raise a Series A round of funding. This cycle could continue through Series B and even Series C until XYZ, Inc. is acquired. In the case of a company like Dropcam, where they exited for $555 million, the two founders could walk away with ~$100 million each. Even with the dilution of multiple funding rounds, their slices of the pie have significant value. This is the power of stock. This is usually part of the reason why founders start startups – a startup is a way for a “normal person” to start with nothing and create transcendental wealth. In the best case scenario, the founder’s stock can reach values in the billions of dollars.